Your browser cache stores copies of webpages, images, videos, and other content that you've viewed using your browser. This helps reduce the number website requests made by your browser. If you go to a site that already exists in your cache, your browser will instantly load it from your hard drive. The cache needs to be cleared periodically in order to free up space on your hard drive, as well as when websites stop displaying correctly - using an outdated site design, for example. Press the following key combination: Ctrl + Shift + Del. 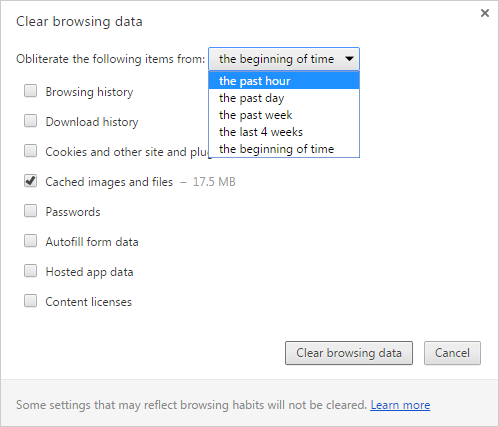 In the Clear browsing data window, enable only the Cached images and files option, and select the time period for which you want to delete the cached data. Click the button marked Clear browsing data. Install the Click&Clean browser extension. In the Chrome block, enable the Empty the cache and Empty application cache options. In the Extra block, enable the option to Delete private data when Chrome closes. In the Clear Recent History window, use the Time range to clear field to select the period of time for which you want to clear cached data. Open the Details list and make sure that only the Cache option is enabled. Click on and select Options. In the Privacy tab, in the History block, choose Use custom settings for history from the list. 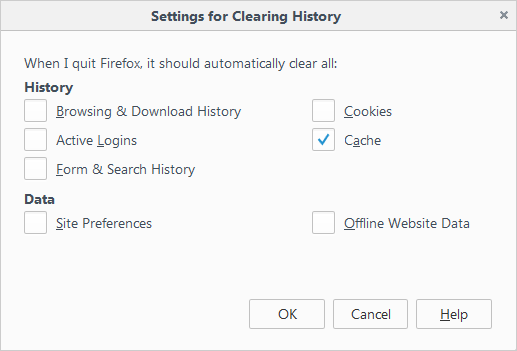 Enable the option to Clear history when Firefox closes. Click the Settings button and make sure that only the Cache option is enabled. In the Clear browsing data window, specify the period for which you want to delete cached data. Make sure that only the Cached images and files option is enabled, and click on Clear browsing data. Note. To find out your browser version, just go to yandex.com/internet or follow the directions below. Press Alt to call up the browser menu. Click on → About Internet Explorer. 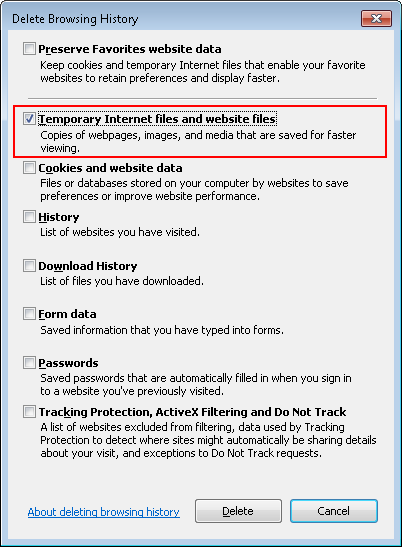 In the Delete Browsing History window, enable the Temporary Internet files and website files option. Make sure that all the other options are disabled. Click on → Internet options → General. 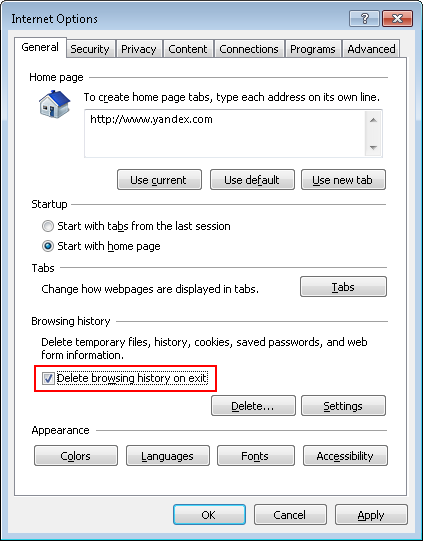 In the Browsing history block, enable the option to Delete browsing history on exit. Click Apply, then click ОК. In the Clear browsing data block, click on Choose what to clear. Enable the Cached data and files option. Make sure that all the other options are disabled. 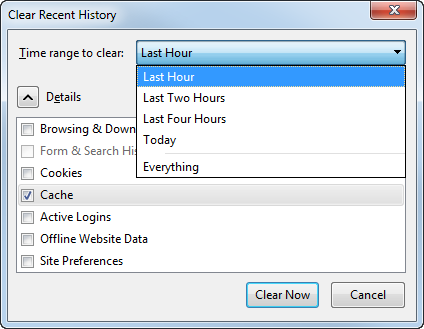 In the browser menu, choose Safari → Clear History. 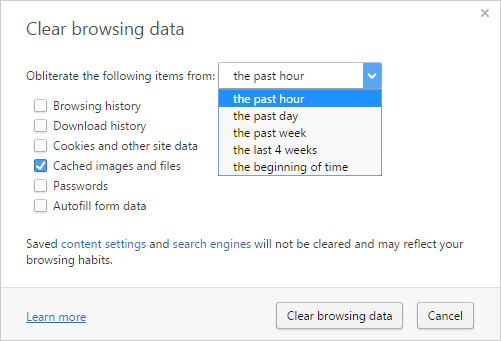 Specify the period of time for which you want to delete your browsing data. 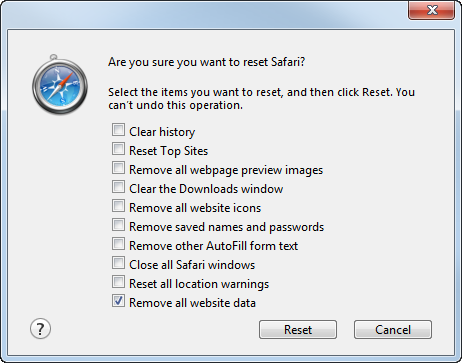 Click on → Reset Safari. In the menu that opens, enable only the option to Remove all website data.